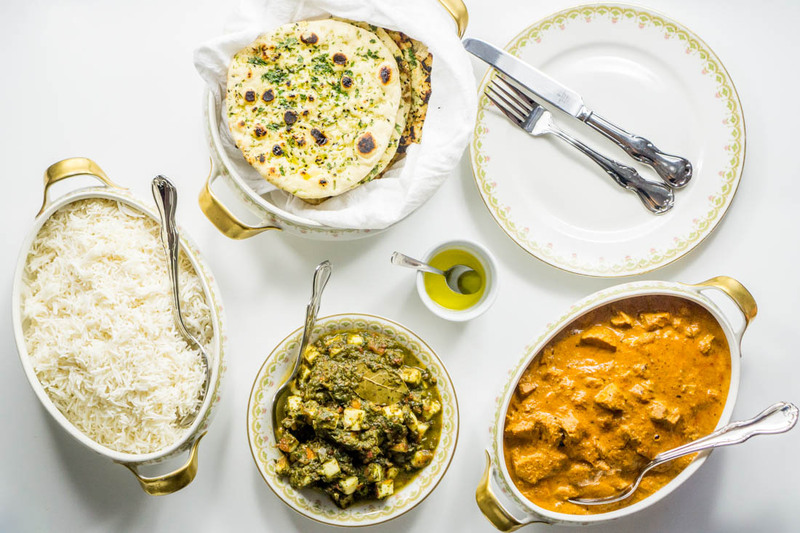 When I tried Indian food, and specifically Indian spinach-cheese curry (palak paneer) for the first time, I was a college student in the Bay Area and Naan & Curry had just opened up on Telegraph Avenue. Although I balked at spending more than $3 for a slice of pizza at Blondie’s or a sandwich at Cheese & Stuff, the heady smell of charred meats drew me in to Naan & Curry. This Pakistani-Indian hole-in-the-wall was about as bare-bones as you could get. Waiting inside the warm, sparsely-decorated dining room, my eyes would water from the intense heat and odor of the frying spices. 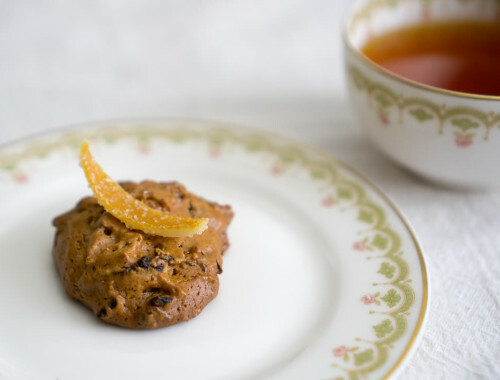 Once my food was finally delivered, fiery hot, I would dip the freshly-baked naan into the spicy curries, tentatively at first, and then with more braveness, and I would down glasses of water and cups of warm, milky chai until I could quench the heat just enough to allow me to keep eating. After closing out my bill, I would step out into the sunshine, taking my first cooling breath in an hour, stomach uncomfortably full, mouth still on fire. That was the first time I tried palak paneer. 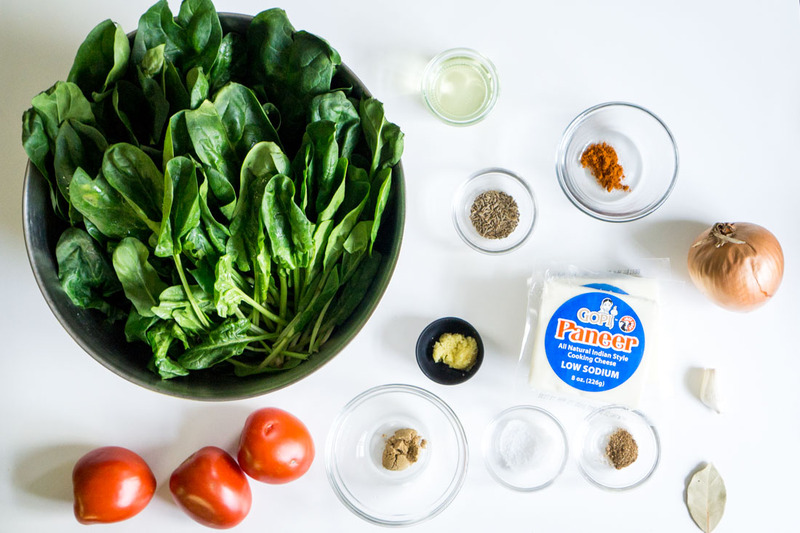 Start with fresh spinach, which must be washed thoroughly before you wilt it over high heat and puree it. 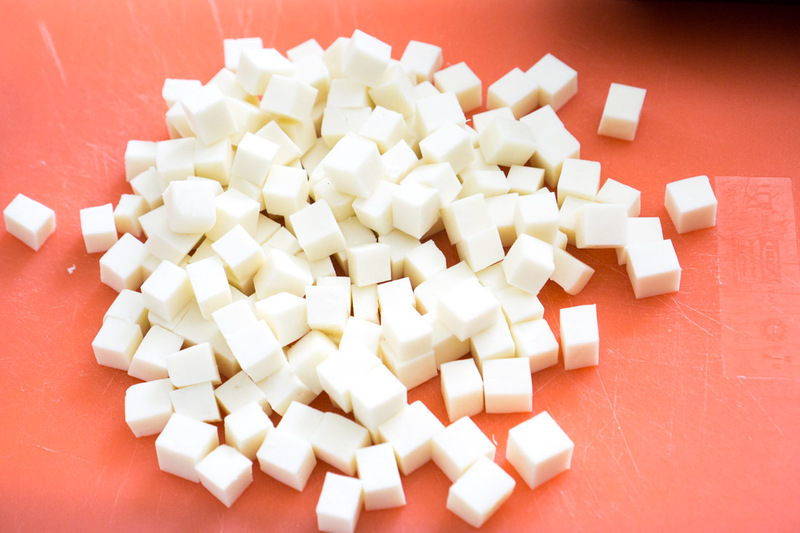 Cube the paneer. Resist the urge to taste the paneer. It looks like mozzarella but doesn’t actually have much flavor. 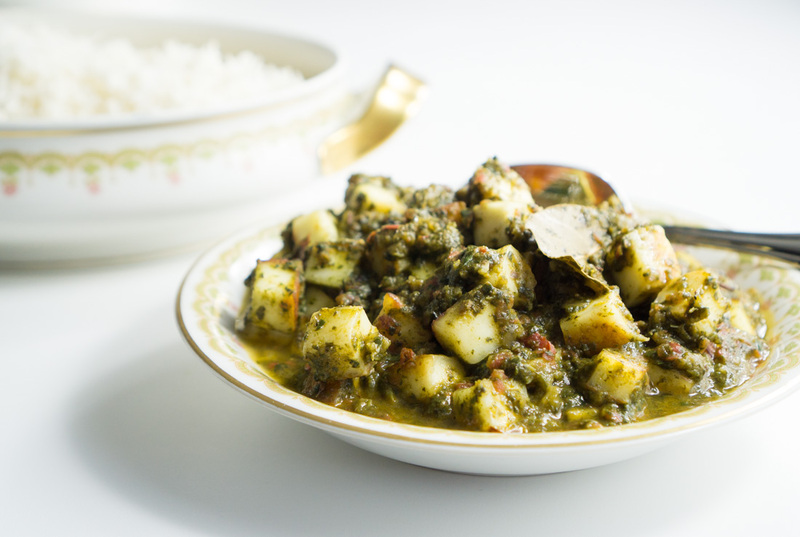 The paneer contributes mostly a mild milkiness, and, after it’s sautéed, a toasty crunch and chewiness. Sauté the onions, garlic, ginger, and spices. Add the tomato and pureed spinach. 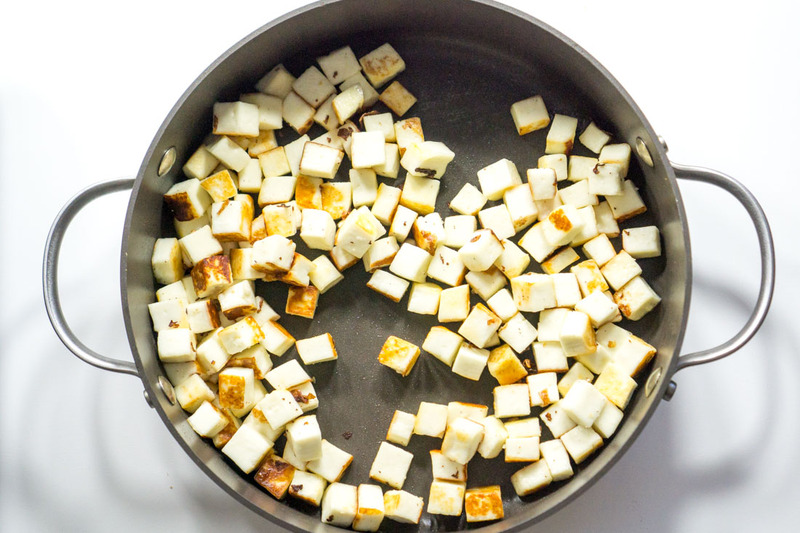 In a nonstick pan, lightly sear the cubed paneer. Don’t overfry, or the paneer will become way too tough and rubbery. Add the paneer to the curry and stir well, cooking the mixture just until hot. 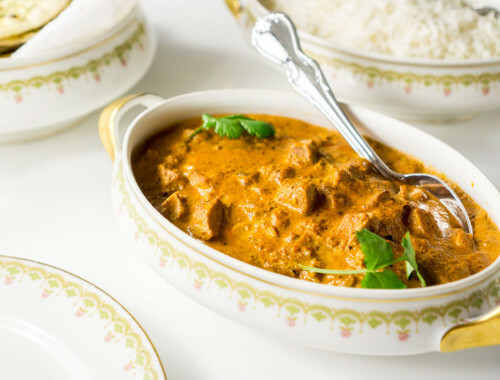 Serve warm with plenty of rice and naan. 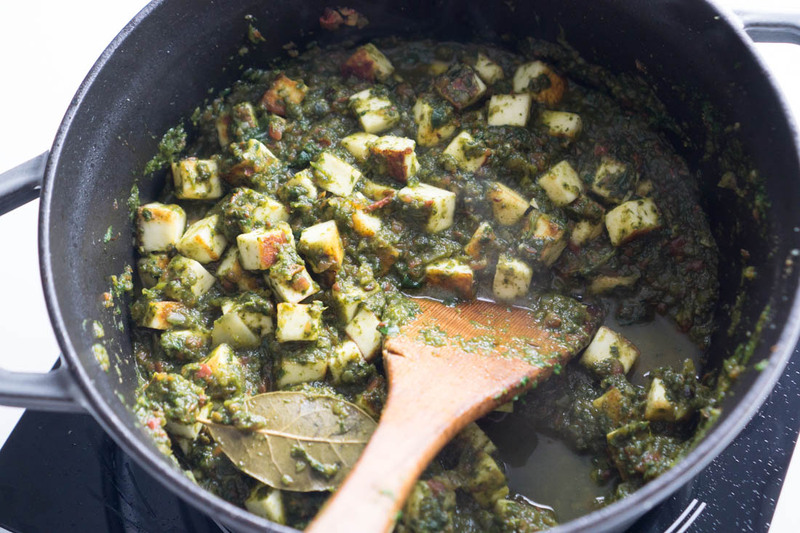 Palak paneer goes perfectly well with butter chicken, too. Enjoy. UPDATE: I think the original amount of cheese called for in the recipe, 500g, might be a bit too much compared to how much spinach there is. So, I’ve reduced the amount to 400g. Prep the spinach carefully, discarding damaged leaves and any particularly tough stems. Wash 3 times, or until there is no more grit on the bottom of your washbowl. Put the spinach dripping wet into a large pot, cover, and wilt over high heat. 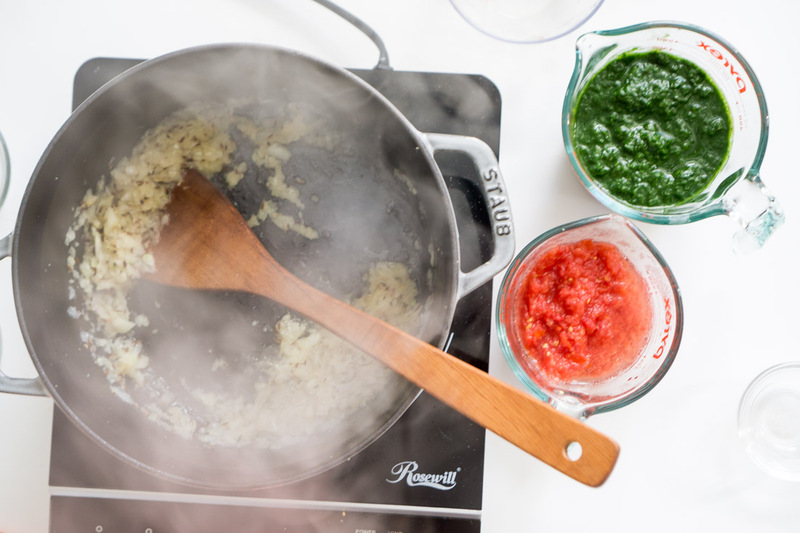 Let cool for a few minutes, and puree spinach along with any liquid in the pot in a food processor or blender. 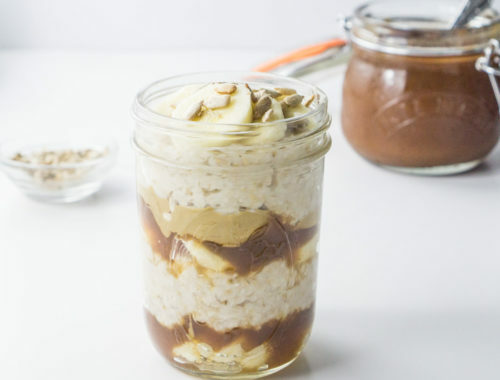 Measure out 2 cups and reserve the rest for another recipe. Heat oil and add cumin, when the cumin sizzles, add bay leaf, ginger and the garlic, and sauté until the ginger and garlic are lightly browned. Add onions and sauté until a golden brown, then add tomatoes and stir-fry over medium heat. When the oil separates from the mixture, add the salt, garam masala, powdered coriander seeds and the cayenne pepper and mix well. Add 2 cups of pureed spinach and sauté for 2-3 minutes. Add paneer and stir, heating mixture for 2 minutes until warmed through. Serve hot with rice and naan.